A restaurant is a complex machine. Thousands of small items come into play every day, but when certain aspects of the operations or the business's marketing are improved, they can make a considerable difference to your restaurant's health. Of course, having good food and a cool location help, but to stand out, iron out the wrinkles if they exist, and take your restaurant to the next level. Your staff is the front line of your restaurant: its voice and its attitude. Training awesome staff is worth the time, but what if your hires were amazing from day one? Employing the right people from the get-go can save time and also money, as letting the wrong person go and starting the process over again takes valuable time away from the management team. Hire the right people, and most of the work is cut out for you. As part of your community, you can give back in many ways. Host a charity dinner with part of the proceeds going to a good cause. Sponsor a Little League team or other youth activity. While good for your restaurant’s image, these types of activities can also offer an opportunity to mingle with the power players in town, as many are involved in charities of their own. 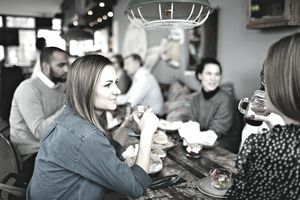 Restaurants have a unique angle on giving back in that they can also function as a meeting place for other events, making your business memorable for more than just the food. Make dining out with young children easier on parents. If possible, families should be given a larger table (if there are four, give them a table for six) so that the kids have room to color or play. Along with offering high chairs and booster seats, the staff should offer coloring materials and toys, but always ask parents first, if these items are OK. Many restaurants keep special kid packs, like boxed crayons and placemats. Having a fine dining restaurant is no excuse not to cater to children. If the most famous restaurant in the world can do it, so can you. If you haven’t updated your menu in a while, time to break out the flavor wheel. Changing your menu has so many benefits it would be hard to list them all. It keeps the kitchen team excited and creative, it keeps diners wondering what you will do next, and probably most importantly, it keeps your restaurant from becoming stale. Check out current restaurant trends and try incorporating them into your regular menu. As the restaurant owner, don’t be afraid to get out and mingle with your customers. Walk the dining room, introduce yourself, and ask for feedback. People appreciate your attentiveness, and more often than not you'll hear praise for your restaurant and staff. If you, however, receive a complaint, do your best to remedy it as soon as you can. Often, the owner is held responsible even when the mistake was with the service or kitchen staff. If a customer complains about a meal, comp the meal, offer a freebie, or give a discount. For example, if someone sends back a steak because it isn’t cooked to their liking, take it off the bill. If it happens a second time, bring a cocktail or free dessert. As a restaurant owner, you have so many tools at your disposal to make a customer happy. Most owners would agree that you do not fix problems to be adequate but to astound. Like in so many other things, your worst enemy can quickly become your best friend. You want to fix the problem early before a bad opinion or review has a chance to make it into cyberspace. If you aren’t using social media to market your restaurant, start right now. Social media is an easy and fun way to reach customers and can be an excellent platform to alert clientele of special events or extra tables. Through social media, you can show off your restaurant through pictures and videos and encourage customers to talk about you with their friends. Taking the time to build a social media marketing plan can pay itself back manifold in new customers and increased online visibility, two things that are vital to the continued success of your restaurant. While it’s easy to stress out over the day-to-day business of running a restaurant, you should still use email and social media to reward those loyal to you. Offering special "chef tables" or invitations to private events can make your restaurant stand out as not just one that serves great food or has a great atmosphere, but one that gives as well as receives. It can be as simple as a Facebook post or Instagram story that directly addresses your followers and friends. The goal is to show people who take the time to follow you that you are thinking about them, too. What Does a Restaurant Manager Actually Do? What It's Really Like to Be a Restaurant Server?